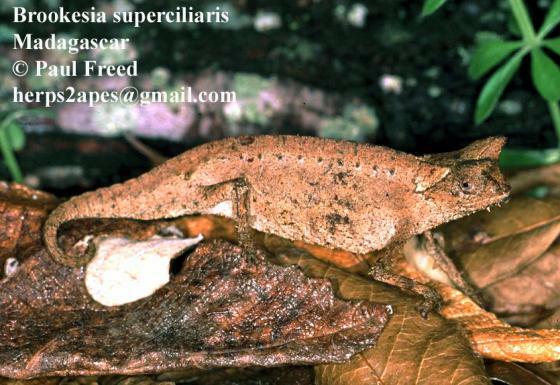 Can you confirm these amateur observations of Brookesia superciliaris? Distribution E Madagascar (elevation up to more than 1000 m). Type locality: probably from Africa (fide NECAS & SCHMIDT 2004). Comment Type species: Chamaeleo superciliaris KUHL 1820 is the type species of the genus Brookesia KUHL 1820. Etymology The genus has been named by Gray in honor of Joshua Brookes (1761- 1833). Brookes was a British anatomist and founder of the Brookesian Museum of Comparative Anatomy. The first officially described species of Brookesia was part of his collection. Tolley, K. & Herrel, A. (eds.) 2014. The biology of chameleons. University of California Press, 275 pp.